Breastmilk substitute. For bottle & combination fed babies. Ready to use. UHT sterilised. Why choose Cow & Gate? When it comes to looking after your little one, support, care and nutrition can all help. At Cow & Gate, we want to lend a helping hand too. Cow & Gate first infant milk is a nutritionally complete breastmilk substitute suitable from birth. Feeding guide 0-12 months Approx. age: 0-2weeks; Approx. weight: 3.5kg, 7 3/4lb, Single feeds: 90ml, 3fl oz; Feeds in 24 hours: 6 Approx. age: 2-4 weeks; Approx. weight: 3.9kg, 8 1/2lb, Single feeds: 120ml, 4fl oz; Feeds in 24 hours: 5 Approx. age: 4-8 weeks; Approx. weight: 4.7kg, 10 1/2lb, Single feeds: 150ml, 5fl oz; Feeds in 24 hours: 5 Approx. age: 8-12 weeks; Approx. weight: 5.4kg, 12lb, Single feeds: 180ml, 6fl oz; Feeds in 24 hours: 5 Approx. age: 3-4 months; Approx. weight: 6.2kg, 13 3/4lb, Single feeds: 180ml, 6fl oz; Feeds in 24 hours: 5 Approx. age: 4-5 months; Approx. weight: 6.9kg, 15 1/4lb, Single feeds: 210ml, 7fl oz; Feeds in 24 hours: 5 Approx. age: 5-6 months; Approx. weight: 7.6kg, 16 3/4lb, Single feeds: 210ml, 7fl oz; Feeds in 24 hours: 5 Approx. age: 7-12 months; Approx. weight: - kg, - lb, Single feeds: 210ml, 7fl oz; Feeds in 24 hours: 3 Assumes weaning at 6 months. Your baby may need more or less than shown in the table, which is given as a guide only. How to prepare: Please follow these instructions carefully. Failure to follow instructions may make your baby ill. 1. Wash hands and sterilise all utensils according to manufacturer's instructions. 2. Shake bottle well. Pour the required amount of infant milk into a sterilised feeding bottle. 3. Serve at room temperature, or warmed if desired. If warmed, check temperature of feed. Dental advice: Look after your baby's teeth. Do not allow prolonged contact of milk feeds with teeth and make sure that your baby's teeth are cleaned after the last feed at night. Ask your dentist for advice. Never leave your baby alone during feeding.<br><br>Important feeding instructions:<br>Do not heat feeds in a microwave, hot spots may occur and cause scalding. For hygiene reasons, discard unfinished infant milk in the feeding bottle as soon as possible, and always within 2 hours. If necessary, offer cooled boiled water between feeds.<br><br>Important notice:<br>Breastfeeding is best for babies. 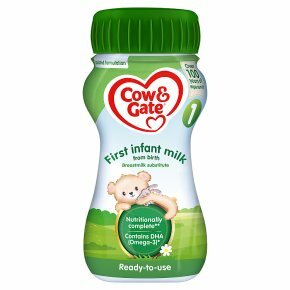 Cow & Gate first infant milk from birth should only be used on the advice of a doctor midwife, health visitor, public health nurse, dietitian, pharmacist, or other professional responsible for maternal and child care.